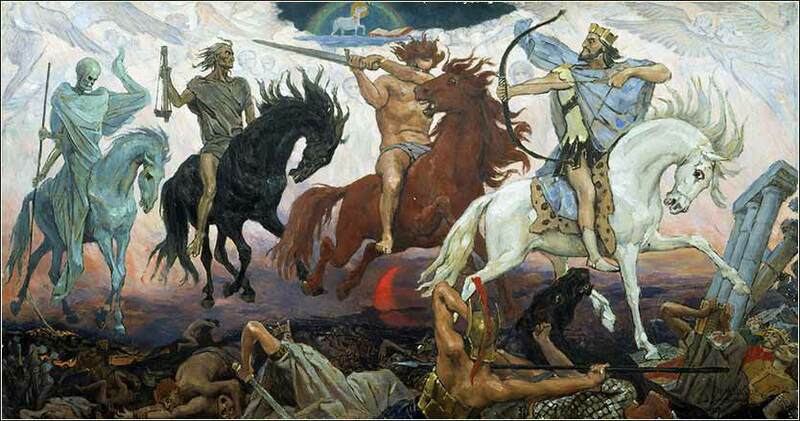 Four Horsemen of the Apocalypse by Victor Vasnetsov ca. 1887. Our Saturday Oldie is actually a recent video, but the Blind Boys got their start singing to Army units in WW2. O Lord, remember not only the men and women of good will, but also those of ill will. But do not remember all the suffering they have inflicted on us; remember the fruits we have bought, thanks to this suffering — our comradeship, our loyalty, our humility, our courage, our generosity, the greatness of heart which has grown out of all this, and when they come to judgment, let all the fruits which we have borne be their forgiveness. Rephidim by John Dubrow, ca. 2003. Hur, shirtless and powerful, stands in the center supporting Moses' right arm, with Aaron seated on the other side. Then Amalek came and fought with Israel at Rephidim. So Moses said to Joshua, “Choose for us men, and go out and fight with Amalek. Tomorrow I will stand on the top of the hill with the staff of God in my hand.” So Joshua did as Moses told him, and fought with Amalek, while Moses, Aaron, and Hur went up to the top of the hill. Whenever Moses held up his hand, Israel prevailed, and whenever he lowered his hand, Amalek prevailed. But Moses' hands grew weary, so they took a stone and put it under him, and he sat on it, while Aaron and Hur held up his hands, one on one side, and the other on the other side. So his hands were steady until the going down of the sun. And Joshua overwhelmed Amalek and his people with the sword. One of the most difficult concepts for a modern Christian to grasp is the distinction between the value of human life, as presented in the Bible, and the value of human life as accepted by contemporary liberal humanism. The feeling that human life is the highest and greatest good derives from Christian doctrine, but it is subtly different from Christian truth. Christianity teaches us not to kill other people because Christ, the human manifestation of God, told us to love and forgive one another for all things. But we do not revere other people because human life is intrinsically sacred; we revere it because God has commanded us to do so. The secular humanist makes man into his god. He has absorbed the teaching of Christ, but then taken Christ out of the equation. The battle at Rephidim is a major turning point, for although God destroyed a huge Egyptian army in the Red Sea, the Hebrews were passive observers; in fact, they were running away. Here, however, it is Hebrew men fighting under God's standard who defeat the Amalek. The Amalek do not drown; they are slain by Jewish swords. God instructs Moses to perform two other notable acts. First, to write down the events in a book. That humanity is expected to read this book is self-evident although, unlike the Passover instructions, the duty to read is not stated. 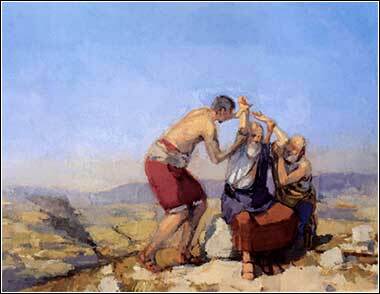 Secondly, Moses is to recite into the ears of Joshua that “I will utterly blot out the memory of the Amalek . . . .” This is where it becomes important to understand why we value human life; for Joshua, with God's instruction, will slay entire tribes. At this point, it is not at all clear how important Joshua is. Unlike the extensive background on Moses, we know nothing about Joshua. That God singles him out for Moses' prophesy is our first indication of Joshua's greatness. He has, in fact, been chosen by God, just as Moses was, but for a different purpose.